Businesses around the world and across the U.S. are coming to realize that many of the steps they’re taking to reduce their environmental impact actually have a cost benefit for their company. But, as we explore in the examples below, going green and cost savings isn’t always as straightforward as turning off the lights at night. Here are three ways businesses, large and small, are going green and saving money. This is one of the most immediate and obvious ways businesses are lowering their impact and making significant cost savings. As fossil fuels increase in price and taxes on landfill go up, businesses are making changes to how they use energy and dispose of their waste to improve their bottom line. But beyond the direct savings of cutting energy, waste and water, companies can save money from the reputation benefits of green behavior. As any company that invests in market research will know, a brand’s reputation plays a big role in its success. The more consumers become aware of the impact of what they buy, the greater the financial incentive for companies to ensure they’re behaving responsibly throughout their business. For example, several years ago a leaked McKinsey and Co. study showed that nearly 10 percent of Walmart customers stopped shopping there because of the company’s poor reputation (including its commitment to the environment). Sourcing plays a particularly large role in the reputation and social success of a business. From logging in the rainforest to polluting the drinking water of poor communities and taking advantage of cheap labor, more and more businesses are finding it financially damaging to continue irresponsible business practices. Finally, going green isn’t all about cutting back and giving things up – it’s also about making socially-responsible investments. Changing traditional business habits to more low-impact alternatives, and investing in smart technology that makes this transition smoother and more attractive, is one way many businesses are going green. For example, investing in better communications technology to facilitate conference calls helps a company reduce the impact of traveling to meetings. To reference GE again, the company doubled their 2005 budget for research and developing technology to reduce energy consumption and waste products to $1.5 billion. The return on investment is high: in 2005, their “Ecomagination” line of products generated $10 billion and $18 billion in 2010. So what does this mean for your business? By weaving environmentally-friendly practices into your business model, you can benefit not only by fulfilling your corporate responsibility, but also running a more effective and efficient business. 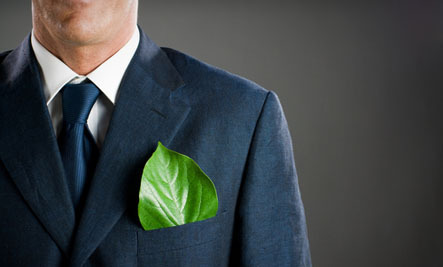 From a consumer perspective, how can you determine if a business is green? Research the companies you shop with most and inquire as to their practices. By insisting on change, you will be doing your part in encouraging businesses to adopt green initiatives and help make our planet better. Paint your roof and your parking lot white. Reflecting some heat will save you $$$ in air conditioning. business and green is an oxymoron. Consumer based culture is not the way to go.